Knighton, it is said, was built on the only flat ground for miles around and you can see why. 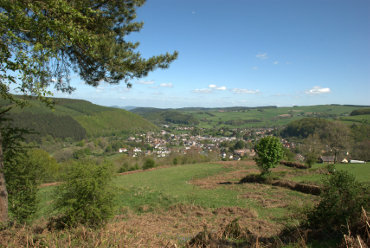 This view is from Garth Hill and shows the small market town nestling in those hills. The town wouldn't be at all unusual if it weren't for the fact that Offa's Dyke runs right through it. 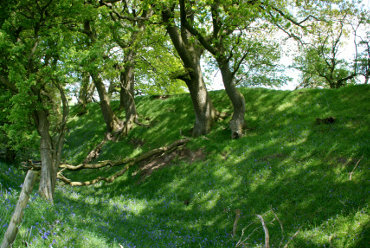 Offa's Dyke is a 177 miles long earthwork, consisting of a bank and ditch which starts on the south welsh coast and runs north along the Welsh/English border to the north welsh coast and Knighton is roughly on the centre point. Built in 1872 the Victorian Gothic Clock Tower stands at the junction of Broad Street, West Street and High Street. The hill showing over the top of the buildings on the left is Panpunton Hill which is on the route of the Offa's Dyke Path. 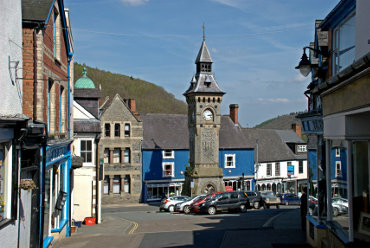 A small part of the town, including the railway station, is in Shropshire, England. This section of the dyke is south of the town on the route between Kington and Knighton. It is well defined here, which is not always the case, with the dyke being about 18 feet above the bottom of the ditch. 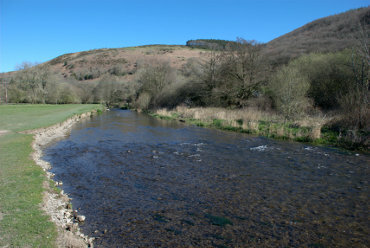 The River Teme has its source in Mid Wales, south of Newtown in Powys, and flows through Knighton where it crosses the border into England. It eventually joins the River Severn south of Worcester at Powick; a total distance of about 80 miles. The Teme valley is exceptionally beautiful and its appeal lies more in small and hidden places rather than in large, popular attractions.